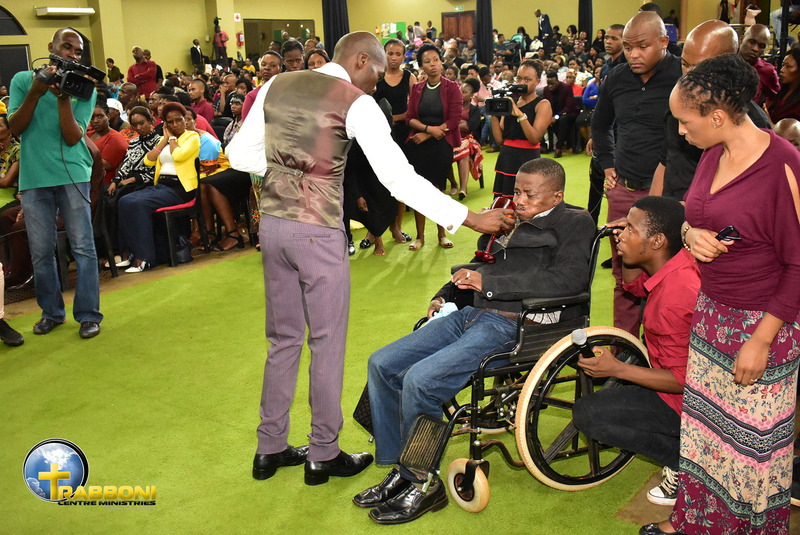 Mr Buti Khomo from Katlegong experienced so much pain in his legs that he could no longer walk and had to use a wheelchair. 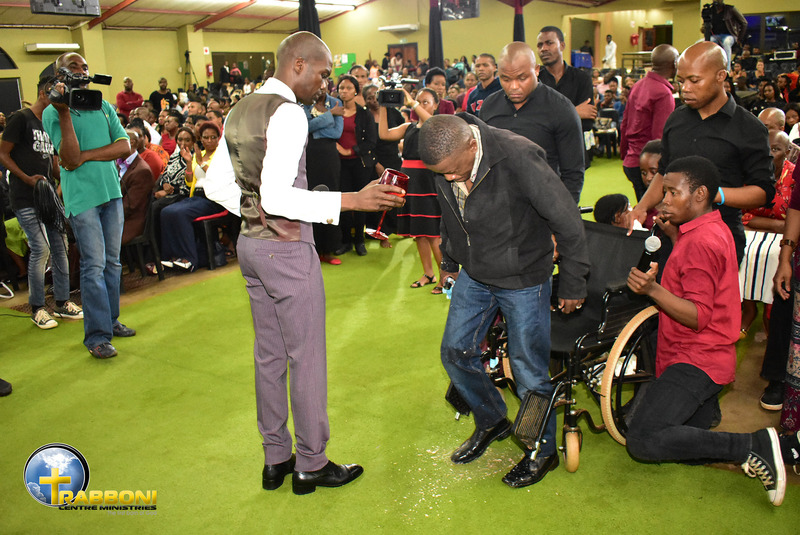 On Sunday (7 April 2019) during the Holy Communion service at Rabboni Centre Ministries, we truly saw the power of God when the 44 year old was raised from the wheelchair and walked freely without pain after drinking the blood of Christ ministered by the man of God, Prof Lesego Daniel. When the man of God finished preaching, he began to demonstrate power of God as he ministered the blood of Christ from the Father’s cup. As lead by the Spirit of God, he called out for those who have been suffering from back pains which caused pressure on the lower back and leg pains. 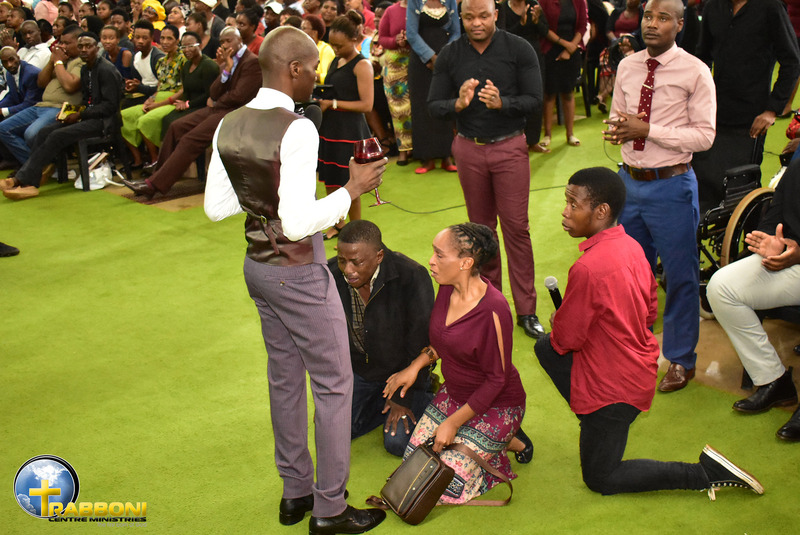 Many manifested and came forth, but Prof Lesego Daniel further called another one who feels pains under his legs and this is due to witchcraft spirit. The man of God explained that both legs are affected but it is worse with the left leg, it’s like it’s being pierced and it’s difficult to walk because it’s like the man is carrying stones on his legs. Then a man was brought forward being wheeled on a wheelchair. When the man of God saw him, he gave him the Father’s cup to drink the blood of Christ the Messiah. As our father continued to give him the blood of Christ, his legs gained more strength. Then suddenly the man stood up from the wheelchair, his legs wobbly, and walked like a child taking his first steps. At that moment, the man of God began to teach that with some, healing takes time while with others it is instant. He further admonished ministers to not only pray for the sick once and move on to the next congregant because no change occurred as yet. He said to them that “you as a minister, your faith is tested at that moment, therefore continue to minister to them”. Prof Lesego Daniel taught saying that healing is progressive; whether it takes many days or even if it’s the same day. This is also an answer from God; for He who began the good work in you will complete it. The man drank again from the cup and his weak knees gained more strength as he was walking. 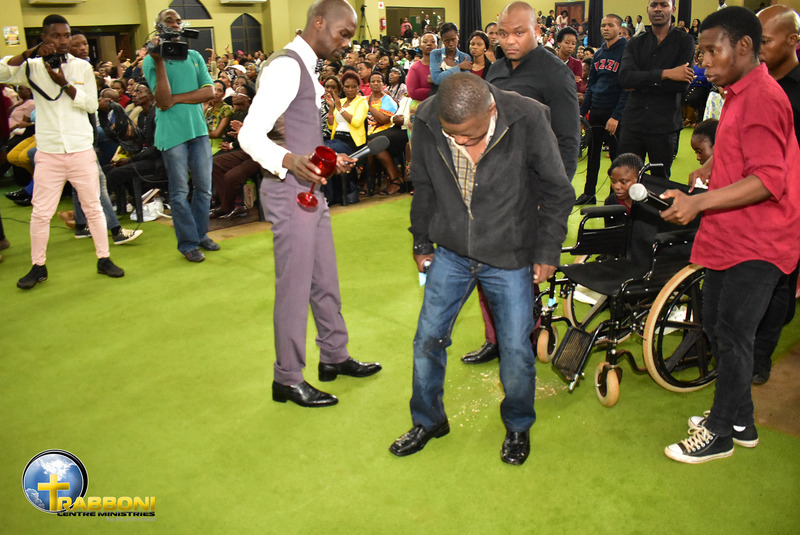 The man of God, Prof Lesego Daniel, prayed for two bottles of communion and declared them the blood of Christ and gave it to the man who stood up from the wheelchair and said that “God is with you”. His wife who came with the man mentioned that they were planning to take him to hospital. But the man of God said that God is with them and God loves them. Mr Khomo knelt down at the feet of Prof Lesego Daniel, crying in thanksgiving. The man is now walking and no longer using the wheelchair. Healing must be there and deliverance must be there as well so that, that thing will not come back 7 times more, the man of God declared. Our team later on caught up with the man and his wife with regards to the detail of his experience. He confirmed the prophecy to be true as he explained that the problem started last week Sunday while he was here in church. He started feeling piercings on his legs and all over his body. He was quickly sent to the medical room for deliverance and blessedly the pain stopped. Mr Buti Khomo said that he was will for the whole week until the morning of 7 April 2019. He then started feeling the pains on his legs again and this time his legs felt ice cold. Nonetheless he came to church and during the day, he quickly went to his car as he was experiencing the pain and weakness on his legs. While he was in the car, he struggled to come back inside the church. He then called his wife and child to come help him walk back to the deliverance room. The disciples of God prayed for him but the pain did not stop. Thus they brought him back inside the church on a wheelchair because he could no longer walk at the time. 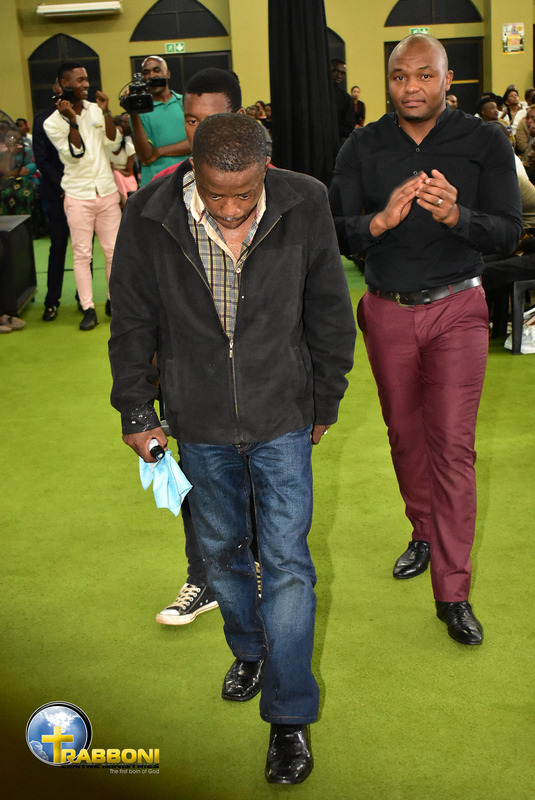 Mr Khomo explained that he still felt pains even during the service until the man of God, Prof Lesego Daniel prophesied about the matter and he was brought to the front and delivered. Mr Khomo gave thanks to God for the healing and deliverance he received.